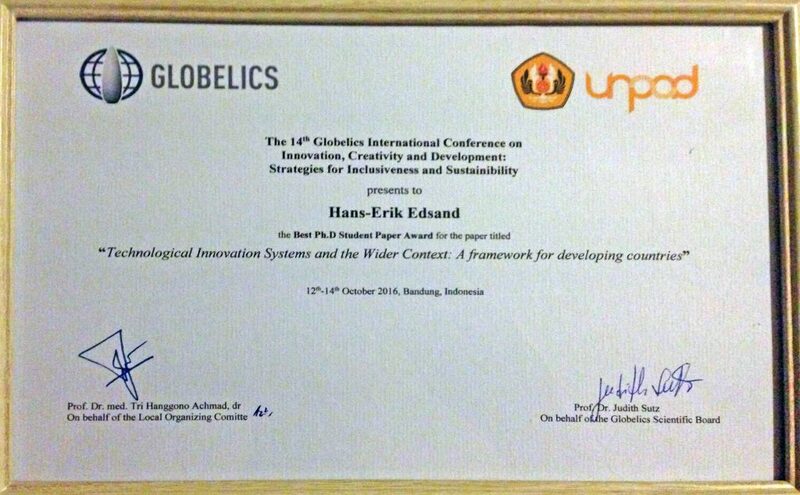 Hans-Erik Edsand from Sweden has won the Best PhD Student Paper Award at the 2016 ‘Globelics’ Conference in Indonesia, for his work on ‘Technological Innovation Systems and the Wider Context: A Framework for Developing Countries’. Read the full paper below. The ‘Globelics‘ conference is an acronym for the Global Network for Economics of Learning, Innovation, and Competence Building Systems. The network brings together scholars who study innovation and economic development, and involves scholars from all continents and different academic disciplines. Globelics is a platform for North-South and South-South interactive learning. It fosters a culture where serious research discussions take place in an open and friendly atmosphere. The “Menhir” in the logo associates global cooperation with the local village world of the hilarious, but often insightful, fictional characters Asterix and Obelix.